Welcome to another segment of Buyin’ Stuff and Talkin’ About It. In this series, I analyze my shopping experience with an ecommerce brand to see what I can learn from it. And I ask what did they do well, and what did they do not so well? Today’s review is on quip, the low-cost electric toothbrush that mixes subscription with a super nice, minimalist design. Alright, let’s jump into my ecommerce breakdown of quip! Now first, a little context. Quip officially launched in November of 2015 and has since raised over 22 million in funding. This is an industry where 85% of the toothbrushes in the United States come from two companies, Sonicare and Oral-B. So as a brand archetype, Quip is a disrupter. It’s entering an established market. It’s mixing things up, and they’re doing it with a modern and techy look, and by building a toothbrush brand that has personality that they get to express through unique content, and with a clear message. What they’re saying is that you don’t have to pay $200 plus for a toothbrush. You don’t have to settle for a bulky and ugly product that, according to them, does more than you need it to. And I resonate with them with this approach because my company Boom is also a disrupter. Our pro age message gives women an alternative to the cosmetic industry’s anti-aging viewpoints. So I like that about them. So let’s take a look at their content and their marketing and see what we can learn. Now, if you’re like me, your first experience with Quip was probably through an ad. So I wanna start there. And as I said, their ads are beautiful, which is always good and distinct. You can see an ad and you know it’s from them, which means they have good branding and good brand recognition. But let’s take a look at the content of one of their video ads. Now what I like about this ad is that it frames the problem. According to Quip, the problem with current oral hygiene is that people are brushing too hard and for not long enough. Now, I’m definitely a hard brusher. My shoulder hurts when I brush my teeth, you know? “And not changing their heads as often as they should,” Quip says. Also, toothbrushes are bulky, ugly, and expensive. And not only are they expensive, but you don’t even need all the fancy features that they’re using to justify the price. This is Quip talking about their competitors. Now, whether or not you agree with them, they’ve created a product that solves a problem, which is so important. And they’re doing a great job of educating me on that problem so that I’ll buy from them. Let’s look at some more of their ads. Woman: Quip is for everyone and anyone. For the early riser and the bedtime defier, for the camper and those who like to be pampered, for those who stay at home and those who explore the unknown. Quip, for you and everyone you know. Man: They go on to say why Quip is for everyone. That’s a pretty great ad, right? And I wanna point out that if you wanna build a company to $100 million, it really starts with a mass-market product. Everyone has teeth. So everyone regardless of age, gender, etc., could use this product. 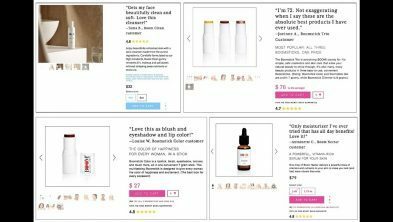 Now, Boom sells skin care for older women. So that leaves me with a lot of people who won’t find my product relevant. So I like that they’re mass market. So okay, the design is great, the content is great, but how about the strategy behind their ads? We’ve been looking at ads in the awareness pillar where they’re trying to get new people into their funnel. And so far so good, but as I looked a little deeper, I noticed some things that were missing. In the retargeting pillar where they’re reengaging with people who’ve seen them in the past, they did hit me with some content to keep me engaged. They showed me some social proof, but there was no abandoned card email sequence or ad sequence, no dynamic product ads, nothing reminding me to go back and complete my purchase. And in the loyalty pillar after I’d purchased from them, I noticed that I wasn’t seeing much either. I mean, I got a Mother’s Day email, the first email I’d received in months by the way, but no ad to go with it. So I will say this, I wasn’t seeing any Quip ads for a while. After like a year of seeing them non-stop all of a sudden zero, which brings up a good point which is that it’s really hard to deal with rapid growth, and especially when you take venture capital money, it can be hard to scale all your systems, your customer support, your technology to match that growth. So I’m gonna give them a pass and assume that they were in a place of transition and a little bit off their game. Okay. So you click on an ad and now you’re at their website. Let’s take a look at what they’re doing on the site. All right. So here we are live on the site. And the first thing that I notice is that they really focus on a hero shot of their product and also a benefit. Right on the home page, they’ve got this moving gif image. They’re saying you can brush better. There’s a call-to-action. I love that. And then they go into their sort of main benefit, which is that it’s a very universal product, right, so designed with every mouth in mind, and they’ve got some more views of their products. So they’re really focusing on kind of the sales proposition, which is that this is really for everyone and they’re showing the product off in a number of ways. And then what I love is that they go into long-form left/right content. And one of the things that you have to confront with e-commerce today is that, you know, 90% of your website traffic is mobile. So I really think we should be looking at this on mobile. And this is what it looks like on mobile. One of things I wanna point out that I think they’ve optimized well is they’ve got a double menu, where they’ve got their left navigation but then they’ve also got the ability to shop or view the shopping cart. So for example, if I go back to the home page and I click Get Quip and I go ahead and add one of these to my cart, you’ll notice that this right menu here that becomes the shopping cart, right? I’m able to see what’s in my shopping cart. So what they’ve done really well is given me a navigation on mobile to see what’s going on in their product but also given me the ability to check out my shopping cart or shop now. So it’s essentially a double header or double navigation that I talk quite a lot about, but done in a really unique way that’s optimized for mobile. And as we look at mobile again, we can see that the hero shot right in the middle of the page here is the same thing as it is on desktop, where it’s really focusing on the value proposition of the product and there’s a big call-to-action that’s a sort of isolation effect where they’re using the green color to really capture your attention and try to get you to click that button. So I think it’s a really well done homepage. And if we go back to desktop, just because we get a better view here of their product, what you see is that they really are focusing on their unique selling proposition. So basically, they’re saying that this is an amazing product. They’ve got a hero shot showing it in use. It’s the perfect brush. It’s a fit for everyone and they’re pushing their subscription. So their long-form left right content is really focusing on their three main value propositions for the product, which I think is really well done. And on mobile, what I wanna point out is that they go…that if you look at the consumption of this, because I mean, the idea with the site is that you’re getting people to consume the content. You can see that they go from hero shot to bite-sized content to consume. And when you think about mobile, you gotta think about scrolls and taps, right? So when you scroll, you go from text to image back to some social proof, which is done really well, right? Time Magazine, GQ, back to image, back to text with bullet points, back to image. So they’re really doing this what I call long-form left/right content and they’ve got their testimonials at the bottom and then they’ve got their calls to action to shop and then they’ve got their content. So I think their homepage is extremely well done, particularly on mobile where we’re seeing a combination of a call to action because they’re hoping that by the time you get to the home page, you wanna shop. So they put that up first and then their main sort of sales proposition, social proof, and then long form left/right content with their main selling proposition, social proof, and then calls to actions to shop. And then if you want to consume content, they’ve got that down at the bottom of the page. So really well done homepage. Let’s now move on and take a look at the category page and see how they’re doing there. And one of the things I wanna point out is this is a venture backed company. They’ve got a lot of money. They’re investing a lot of money in user interface and user design. And frankly, it’s the first time that I’ve seen a double header on mobile done the way they’ve done the mobile double header. 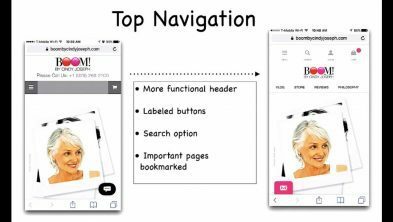 Now we have double headers on mobile where we’ve got header number one with our kind of main site navigation and header number two with more product navigation. They’ve split this on mobile. If we go back here, I really wanna point this out. It’s a very unique feature of an e-commerce website. The way they’ve done their double header saves a lot of vertical space, which is what you’re looking to do on an e-commerce website on mobile is save vertical space so there’s more space for content. I really like that. I’m gonna go ahead and split test that on my website because I’ve actually never seen that before. So let’s go ahead and move on to the store page. So if we look at their store page, we’ll notice that they’ve got social proof right at the top, right? One of the first electric toothbrushes approved by the American Dental Association. So they stick that right at the top for authority. And what you can see here is that really there’s not a lot of attention put on sales content on this page. They’re assuming that you’re sold. I’d like to see more content about the products on this page. So they’re basically just trying to buy, like they’re assuming that through their homepage, they’ve done all their selling, which I kind of disagree with frankly. I think you should be selling on every page of the site, and there’s no selling done here. I also don’t think they’re doing a great job of the isolation effect, right? Like these Add to Cart buttons, they kind of pop, but this light green color against the white with all this gray, I mean, just doesn’t really stand out for me and especially on mobile. Take a look at it on mobile as well. We’ll go ahead and pop into their store, because again, most people are viewing on mobile. I would make these buttons full width on mobile. I would make them a darker, more bold color. I’d have them be a different color from this Quip and this thing in the cart here. So I think there’s just not the greatest amount of…I think their store page could be really increased by adding some unique selling propositions, some benefits, a little bit more of the isolation effect on the call to actions, making the call to actions bigger and better, and also offering people the ability to purchase the products not on subscription as the first thing. I mean, I know they’re pushing subscription heavily, but I wonder if that would convert better for them. So I’m not super impressed with their store page. I mean, I do like the hero shots of the product. I do like that you can add the product to the cart right from the category page, although one thing I will say is that on our collection page, we discovered that actually using the collection page as an opportunity to sell more and get people to move to the product offer page where there’s a deeper explanation of the product, performed better than asking people to add the product to the cart right on the collection page. So I’m not loving their collection page. Now let’s move on to the product offer page. Okay. So you know what I just realized, it’s actually they do not even have a product offer page for any of these products. They literally just have this collection where you can add these things to your cart. There’s no sort of individual product offer pages. They really just have their home page, which is where they’re doing all of their selling. This is essentially their long-form product offer page and then when you click the call to action to Get Quip, you can then… yeah, I guess they’ve got a little bit of…let’s see. Okay. Quip, it drops you down. So that’s an anchor. So this button here anchors you down where you’ve got a little bit more information. And then when you click Shop Now, this is essentially their catalog page and their product offer page and then essentially you go from here to the cart. So, I think that they could do a better job on these by having individual product offer pages that kind of explain a little bit more of what you’re getting. I’d be curious about that split testing that for them rather than just having the collection be where they’re doing all of their selling. One of the things I really like about this brand is that they use a lot of fun and story based content to really engage you in this. There’s a lot to talk about when it comes to your mouth. They’ve got helpful tips on hygiene, like the right and wrong time to brush, how to avoid bad breath, teeth whitening. They’ve got fun content like what Quip says about you, Quipstrology, or six ways to reuse your refill packaging. And then they’ve got really nice About Us content, like the story of Quip and an interview with the founder. So there’s plenty here to engage users and get them to develop a relationship with the brand. 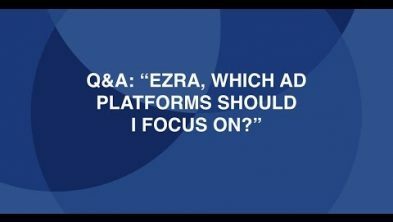 And one of the things that I’d like to see from them is more video content like they’re doing in their ads. I mean otherwise their blog is really great and they do have some video on social but not on their actual website. So I really like that they do have a lot of content on the site, like About Us, and Our Story, and then they’ve got tips for you. They’ve got different plans. That’s them selling you. But there really is a ton of content onsite. And one of the things that I’ve noticed is that when they retarget me, they’re not retargeting with this content. They’re not using that content in the sales cycle. And when I get to the emails section of it, you’ll see that like, I’m really disappointed with how they’re using email marketing. I think that their email marketing and their content marketing for a brand of this size and this stature is really subpar. I think they’re really banking on the quality of the product, the fanciness of the product, and the design to do the selling rather than like, using this amazing content that they’re producing. And they’re not putting that in front of me in the way that I think they should be in order to engage me more. I mean, they have it all, they’re creating it, but they’re not like doing a good enough job of putting it out there. So let’s talk a little bit about that. So, one other thing that I was suspect of…I mean, I’m a big fan of this brand. I don’t wanna sound like I’m knocking this brand. One of the things I was suspect of was this Ajax shopping cart that pops out when you add a product to the cart and then kind of disappears immediately. My view of this product is you really only buy one at a time. So I think they would have a much better job literally taking people directly to their shopping cart rather than popping up that Ajax cart that then disappears. And I wonder what happens on mobile. You click Add to Cart. Yeah, again on mobile you don’t…I think they should skip this step and go direct to the shopping cart. And we’ve definitely found that to be the most effective. And then they’ve got their Continue Shopping button, their Checkout. Again, I’m not loving that isolation effect. And their shopping cart I think they could use some social proof, right? Like, once you get to the shopping cart, this is where you’re about to make the decision. And I don’t see any of their social proof. I don’t see any testimonials. I don’t see any imagery here in the cart. So I think their cart is a little barren, and I think they could significantly increase their conversion rate of their cart if they were to add some social proof content here and also add other payment methods, like, “Check out through PayPal,” or, “checkout through Apple Pay,” rather than just having the one checkout button. So then when you click Checkout, you’re forced to sign up. Again, I’m not so sure about that. I’m an existing customer, but anyways, I think that their checkout process could use a little help. Overall though, their site is very fast loading. It’s well done on mobile. I just think that there’s some places obviously that that they can improve from a conversion rate perspective. But then again, they do a lot of their selling in the ads themselves and perhaps they do have an optimizer on staff who is attempting to optimize this stuff. But it does load fast and it is beautifully designed. So I give them a win, but I think there’s some slight improvements they could make to the overall sales process. So now let’s talk about their email game, which frankly is a little subpar. So pre-purchase, before the purchase, now I’d already bought, but I had my team opt in to the website to just see what emails they’d get pre-purchase. And it turned out it wasn’t much. And something must have been going on with these guys because they didn’t send any pre-purchase content. And as you can see from their website, they have a ton of it. No abandoned cart emails, which is absolutely crazy. I mean, literally 70% of people are gonna abandon the shopping cart. And so to not have an automation sequence in place for the folks who enter their email address at the cart with purchase intent, you’re just losing out on a ton of revenue there. So I thought their pre-purchase email game really needed some work. They have so much content that could be reengaging with. And this what’s I was saying about their retargeting ads is they were not using though the content that they’ve created that’s really engaging and funny to retarget me and get me back in the purchase cycle. So I think that their pre-purchase email game and their pre-purchase retargeting game could use a lot of work. They should be sending a lot more emails, and they should be leveraging the content that they’ve created in that purchase cycle. So now let’s talk about post-purchase and promotions, so after someone buys. Now, I know they have great emails because, like for a second, they were sending me stuff post-purchase. They sent me this like Olympics themed email. They sent me this tips email, like how you should get your toothbrush wet before applying toothpaste. And I mentioned there Mother’s Day email, which was really good. But I didn’t see any other promotions where they were trying to cross sell me products like their toothpaste or get me to refer friends or get Quip for a family member. So they weren’t really like pushing very hard on the promotion side. And I also didn’t receive any emails trying to get me to engage with them on social to leave a review or any other user-generated content, which is interesting because they like have this post on their blog, “Share your Quip pics to win a year for free.” And I didn’t get an email about that or get ads run to me about that. So I think they could do more with their emails post-purchase to like keep customers engaged, to get some of that user-generated content, to elicit reviews. I think that like, they’re producing all this amazing content, but then they’re not like, doing the work to get it in front of me via advertising and emails, which as we know are the two ways that you get content in front of customers. So, I’m a little confused and I think maybe there’s just some disconnect in their digital strategy or they just haven’t gotten to it yet because they’re a new company and they’re dealing with growth. I’m not exactly sure. So, in final, talking about how’d they do, right, buyin’ stuff and talkin’ about it, what is my overall sort of a view of Quip? I think what they have right is the one thing that kind of trumps everything else, which is an incredible product. Their product is really, really good. It’s so good. I was a Sonicare person. I was like Sonicare for life. I would never have considered switching from Sonicare. I just loved my Sonicare. And I saw these people’s ads for like a year, and eventually, I thought, you know, Sonicare tickles your nose and it’s all intense and I just thought like, “Okay. Maybe I’ll give them a shot.” So they advertised for long enough and they had compelling enough imagery and their design of their product is so much better than the design of the other products in the space are bulky and big and loud that they ended up winning me over. And ultimately, I liked the product so much. It was such a gentle brush compared to the intensity of the Sonicare that I bought one for my wife. I bought one for my cousin. And I signed up for their subscription to give me a new battery and a new toothbrush head every three months, so like, I really think that they’ve done product extremely well. And I think their minimalist design on their website is great as well. But I think that ultimately, from a direct response marketing perspective, they’re not the greatest direct response marketers. Like, they’re creating all this amazing content, but then they’re not amplifying it or putting it in front of me. They don’t have good pre-purchase email sequences. They don’t have good cart abandoned email sequences. They’re post-purchase cross-selling is kind of non-existent. They’re still retargeting me after I bought, which means they’re not excluding buyers from their ad targeting, so like their marketing is like really subpar from a structural standpoint. I don’t think they’re frankly paying as much attention to conversion rate optimization. I don’t think anyone’s split testing those pages. So I think that like, what they have is an incredible product and they’ve got a lot of money and they’ve got great design, great design of product, great design of ads, like their design is on point. So I think that like man, if you’ve got a good product, it really carries you far because people become evangelists. I’m an evangelist for this product, and I thought I would never be a not Sonicare person. So I’d like to see them expand their product line into toothbrushes, into floss, into picks, into UV, head brush sterilizers. I think they could expand their product catalog. I think they could do a lot better post-purchase, upselling, cross-selling, remarketing. I think they could do a lot better pre-purchase marketing. I think their conversion rate optimization needs work. So, I’m a fan of the brand. I’m not the biggest fan of their direct response marketing. I think it needs work. But at the end of the day, I give them the seal of approval because they do the one thing that you need to do right, which is have an incredible product. So I’m fan of Quip.